As endless as PhDs may seem to those in the thick of them, they do end. I am now almost exactly one year out from my planned graduation date, which means that I need to transition from collecting my data to analyzing and disseminating my results. 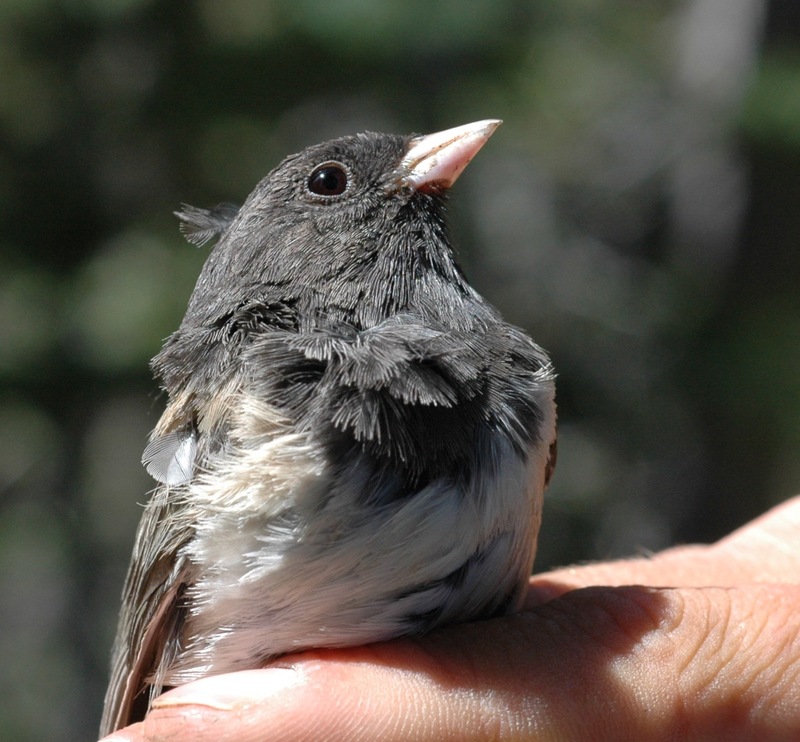 Practically, this means that I can’t spend the whole summer out in the mountains tracking juncos, like the last three years. I need to also spend the summer running analyses, writing, and presenting at conferences. We do not miss you. Look, why don’t you not come here, and we’ll send you a postcard maybe? This week will be the first field excursion of the final, abbreviated field season of my PhD research. It will be busy: we won’t have much time, and there’s a lot I want to do. Song recording will be a priority, since one of my amazing field techs is doing an honors thesis on song. We will band some new birds, as usual, but it will be just as important to resight the birds we banded over the last few years. Who is still alive? Who is mating with whom? And of course we want to find nests. This time of year, we probably will only see eggs; this presents a bit of a challenge, since it’s important to me to put dates on nests (i.e. the date of egg-laying, the date of chick hatching), but a nest full of unhatched eggs doesn’t immediately tell you either of those dates. Juncos incubate their eggs for about 13 days; we could easily check nests for the duration of our field excursion and never see any eggs laid or hatched. If that happens, we’ll use the duration of our egg-checkings to estimate the dates: if we know the eggs were being incubated for a given five days, we know they must have hatched sometime between the day after the last day we checked them, and eight days (13 – 5 = 8) after the last day we checked them. That at least gives us some information. Some field ornithologists can age eggs by looking at how they float in water. Eggs lose water over time, and the floating behavior of an egg tells you how much water vs. air is in the egg, so you can float eggs and see how long it has been since they were laid. This requires some advance planning in terms of calibrating your float measures to your specific eggs, which I never got around to doing, so I’m left with my approximate estimations based on dates. There are a few birds I especially want to see again: ARKM and MABY, who were each other’s mates in 2013 and 2014; AMYY, whose nests I always find, much to her annoyance; LGAG, who we banded way back in 2012 and saw last year; and, of course, any of the juncos we banded as chicks. AMYY when we banded her in 2013. And I especially do not want to see rain. I know California is in a drought, but look, it can rain in the mountains any other days this month; just not in the next week. I only have a few brief chances in the field this summer. If it rains, I am not leaving. I will stay and get wet and take observations. 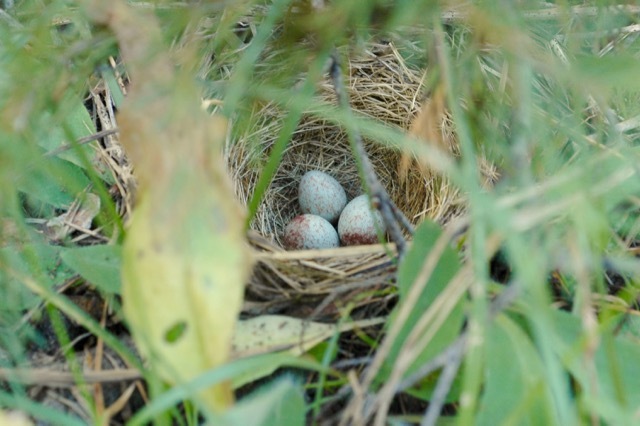 This entry was posted in field work and tagged Dark-eyed Junco, field work, nest by toughlittlebirds. Bookmark the permalink. Thank you so much for putting all of this information online. 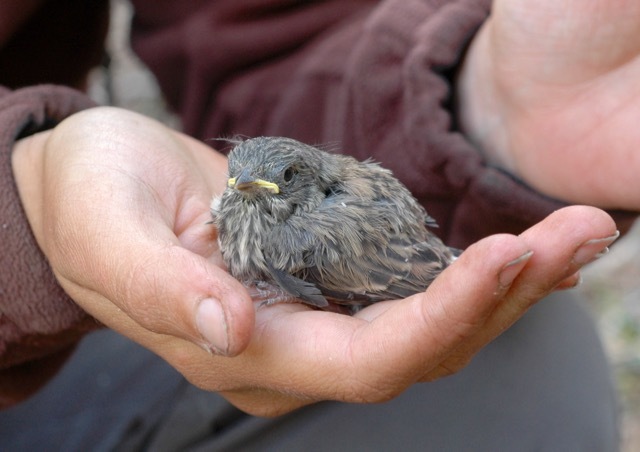 We first thought we had a titbush, but a local bird person at our vet said “nope!”. We have an interesting situation! One of the four hanging Azalea’s in front of our large living room window looking out back was adopted by a Junco to make her nest a couple weeks ago. I work from home on the couch a lot and noticed she was rustling about in one of the pots, and we watched as she built her nest and had the courtship dance with her mate on our back patio table. The puffed up half wing hopping dance. Last week, 9 days ago, my wife found eggs. But what a bad time! Our house is scheduled to be painted next week!! We had to move our old Home Depot dog kennel away from the house for the painting, and it has that green fiberglass cover over half of it. So I took the hanging plants and hung them in the kennel from the wood holding up the fiberglass, and the remaining plant with the nest went on a chair down low but close to where it was. After some fluttering about where it should have been, she found it. A few hours later I moved it next to the kennel, and again after some fluttering about she found it. I should note the whole time we were messing with her nest she was on the roof “chipping” at us while the male kept close guard warbling on the pear tree in the yard. A few hours later we moved it hanging in the same position with all the others that were in their old spot by the window; and she settled right in. Now I see her come and go every few hours for 15-30 minutes. Still eggs as of today. She knows us know and will hardly rustle if we poke our noses up close to within a few feet of the pot she is nested in. The big problem is the powerwashing and painting going on next week. We have a small house so the work should not be more than a few hours in close proximity to her nest, which is now about 10 feet away from the house. We thought about putting a tarp up on the kennel facing the house so at least there’s no sight danger. But there will be noise. It’s about the best we can do short of putting her down low with all the neighborhood cats and racoons (something for fledgelings to contend). I hope she doesn’t abandon it! That’s the dedication I would expect from you!